To say that I love this ottoman is a understatement. My friend Jade told me the plan that she had to make a coffee table and I told her that she would love a tufted ottoman instead. She had a event at her house the next day so she was in a hurry to get something done. It took us about 4 hours from start to finish but it is soooo worth it! We followed the Tufted Headboard Tutorial that Mallory and I did a few months ago. All the supplies were the same and everything. a piece of plywood that Jade’s husband had found. Jade’s husbands also add 2×4 around the plywood for extra support and something to screw the legs into. Jade bought the 3 inch foam in Mesa, Az at mesa sales on Main street between Gilbert and Lindsey, they were the cheapest that I have found. All the other stuff was purchased from Hobby Lobby. We started to mark off were we wanted each tuft to be. The board was 44 inches width so we used our rusty math skills to figure out where each hole would go. Then removed the foam and drilled holes in the board. After the holes were made we used spray glue to add the foam to the board. After covering all the buttons the fun begun. For more step by step on this part check out our Tufted Headboard Tutorial. Here is the finished product. Jade went to Lowes and got 4 legs that were around $5 each, they were too tall at first so they had to be cut down. She spray painted them white, and used some hardware that allowed her to screw in onto the wood and then the legs just screwed on. The hardware was only like $1.50 each, and very easy to put on. I am Obsessed with how great this little table turned out! Oh my, this is so very beautiful. I love it so so much! Great work. This looks amazing! Love it! The tufting is beautiful. You are amazing and I am so happy that you talked me out of a boring old coffee table and gave me this dreamboat instead!!! So talented!! I love this. I have a link party on Wednesdays, and I would love it if you would link this and any other posts. It is called Wednesdays Adorned From Above Link Party. It runs from Wednesday to Sundays. Awesome! I’m gonna try this with an old kitchen table (and shorten the legs too). Great tutorial! In love with this:) Great DIY and thanks for sharing!!! I love burlap and tufting. Your ottoman is awesome. WOW! 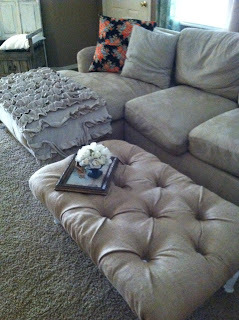 I hadn’t thought of creating a tufted ottoman by creating the whole thing from scratch. LOVE IT. What a great conversational piece, too. I’m sure people ask you about it, and you can blow their mind by saying you made it! WOW! you did an amazing job with the tufting! fab!